Top of the range, concealed GPS speed camera safety system. Legal to sell and use across Australia (when used in GPS only mode. WA – 100% legal in full detection mode). TotalShield™ technology also offers complete invisibility to all RDD’s (radar-detector-detectors). Can now be integrated with the best in laser detection and shifting technology, the ZR5i with 2 to 4 laser heads for 360 degree protection. Complete Protection – There is an arsenal of speed cameras being used to read and capture your speed. Mobile Radar – The latest camera being used across Australia is the frequency hoping, almost impossible to detect Multaradar CD and the Gatso RT3. The XRC-ULTIMATE processes and provides early warning of all mobile radar cameras. The expanded K band range unique to the International models provides long range on the Redflex mobile radar cameras. Mobile and Hand Held Lasers – Line of site early warning and detection of Poliscan, Trucam and all laser cameras. Add a rear sensor for rear facing Poliscans or add the ZR5i for early detection and time to adjust your speed. Fixed and Redlight Cameras – The XRC-ULTIMATE comes preloaded with the up-to-date GPS locations of all fixed and red light cameras. Update the GPS database at any time via a free download. Mark additional GPS locations yourself at any time. GPS Only Mode – Not only is this concealed detector undetectable, but with the push of a button, makes it a legal GPS only warning device. Resetting the device will delete the installed radar and laser software. Just reload the radar and laser software via a PC when you need it again. Discrete Design – The physical design of the XRC-ULTIMATE allows for simple installation & complete concealment to avoid theft or damage. All components are a simple plug-n-play interface with the main module, and it also enables multiple installation options due to its separate display and control modules. TotalShield™ technology also offers complete invisibility to all RDD’s (radar-detector-detectors). Disclaimer: These devices are designed as safety warning systems to give the driver advanced warning of speed measuring devices and traffic hazards. 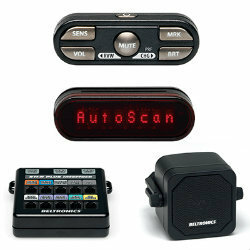 Beltronics and its partners in no way condone speeding or dangerous driving. These devices do not guarantee that you will not be detected and issued an infringement if driving outside the law. Beltronics and its partners are in no way responsible for the use/misuse of these devices, and as a result, will never offer reimbursement of speeding infringements for any reason. The use of the radar and laser detection features may be illegal in some states. Check applicable laws before using. Beltronics and its partners cannot be held liable for the illegal use of radar and laser detection features by an owner in jurisdictions where it is prohibited.